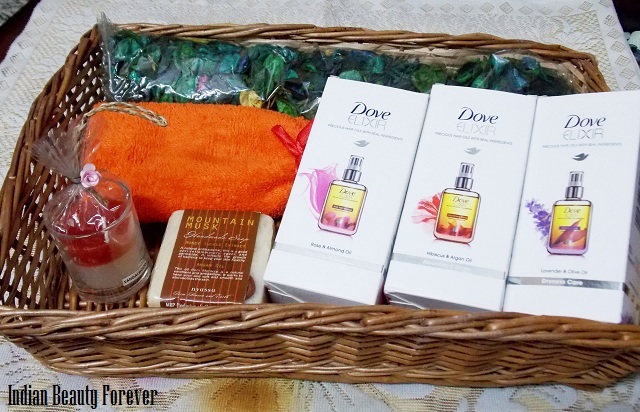 Recently, I posted on Facebook about this contest sponsored by Dove India where 3 lucky people can stand a chance to win a Gift hamper like this. This is Dove’s hair spa Gift hamper, I am talking about. Spas are refreshing, makes you rejuvenating but at the same time, Spa treatments can be costly. I received my hamper 2 week ago and have already used it twice. Dove Elixir precious hair oils have real ingredients that provides the power of overnight oiling in 30 minutes. Formulated to make oiling the mane a more convenient and nourishing experience, Dove Elixir is made with real ingredients like the blooming roses and oils of playful lavenders and wild hibiscus infused with almond, olive and argan oil respectively. My Hair Spa at home experience- I liked the Argan oil one and it does makes my hair really smooth and silky even if I do not keep it over night just about half an hour before shampoo is enough to give you the results. The other products in the hamper like scented candle, dried flower leaves just enhanced the experience and made it spa like. Along with that I loved the organic handmade soap that makes my skin smooth keeping in mind the weather. 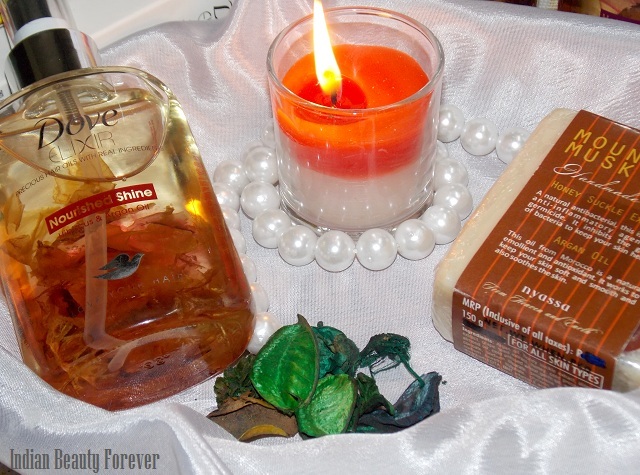 My First experience was great with the Dove elixir Argan oil and this hair spa hamper. Kindly do not send copied entries! It's better to be fair or rather not participate that way! Contest is for 10 days only and ends on 16th of December. PS: Contest is for Indian Residents only with a valid postal address. 1. Whenever I manage to get some free time even for just 30 minutes or so, I have learnt to make the best of it. Just leave everything aside - no the world wont end, if everything is not in its place for a few minutes. Everything can wait. Then draw the curtains.Light some fragrant candles around the house. Put on some meditation videos or calm soothing music, calms the mind down a lot. Also soaking my feet in a tub filled with warm water added with fragrant bath salts, a relaxing good hair oil massage Dove Elixir Argan oil and Hibiscus for Nourished Shine, then followed by a nice warm shower with Dove Bodywash. Step out and gently applying Dove Nourishment Body Lotion all over - Helps my mind, body and soul relax and take on the world !! 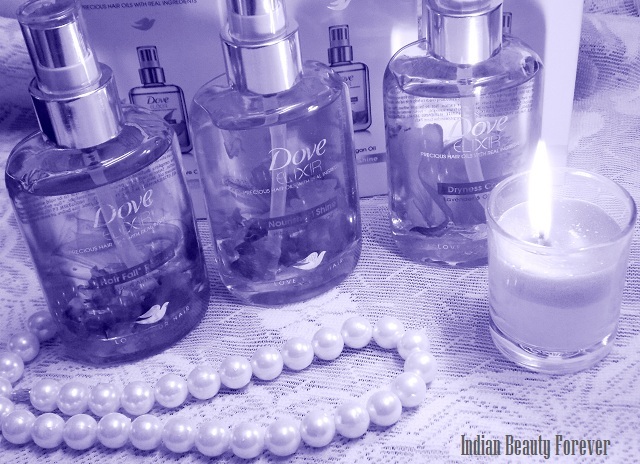 PLAY LIT MUSIC AND MASSAGE YOURSELF STARTING FROM HEAD MASSAGE WITH YOUR FAVOURITE OIL JUST LIKE DOVE ELIXIR AND THEN QUICK STEPS OF FACIAL MASSAGE,THEN SOME PART OF BODY YOU LIKE TO MASSAGE AND RELAX .MANICURE AND PEDICURE ARE VERY EFFECTIVE RELAXING POINTS. LIT COLOURFUL FRAGRANCE CANDLES, PUT SOME ROSE PETALS ON THE WATER .ADD A FEW DROPS AT A TIME OF YOUR FAVOURITE ESSENTIAL OIL SCENTS AND SLIP INTO BATH TUB TO RELAX IN HOT WATER BATH.CLOSE YOUR EYES ENJOY THE FRAGRANCE,MUSIC,CALMNESS. 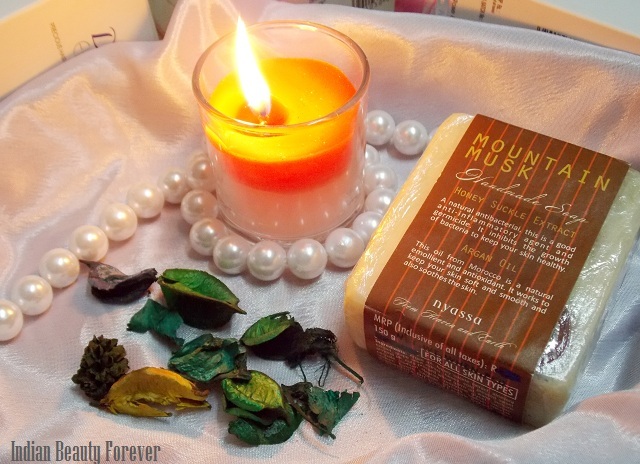 USE NATURAL FRAGRANT SOAP THAT MAKE YOU FEEL FRESH . YOU CAN DO BODY SCRUB AND PEDICURE.THEN WASH YOUR HEAD WITH DOVE SHAMPOO AND CONDITIONER IT.DRY YOUR HAIRS. I REALLY want a proper environment and time FOR MY SPA. IT IS VERY IMPORTANT TO FEEL RELAXED..
1. I lit 2-3 candles in my room and dim lights then I spray my favourite room freshner. 2. Relax myself and start oiling my hairs with gentle circular movements. I prefer a mix of olive and almond oil in winters. And trust me the results are always magical. 3.I steam my hair with a steamer or wrap a hot towel for about 15 mins. 4. Then i wait for 2 hours to let hairs absorb the oil. In the mean time I do manicure and pedicure. 4. After 2 hours I wash my hairs with beer shampoo and warm water. Conditioning, a most important step after it. 5. Then I apply hair mask. Hair mask- 1 banana, 2 spoons of yogurt and honey each. I apply it for 1 hour and again cover my hairs with a shower cap . I am really addicted to it and love my beautiful hairs. music, run your bath and get your beverage. days, save these just for your spa time. * Massage your scalp with olive oil. * Dip a towel in warm water and squeeze the excess water out. Wrap the towel around the hair. * Wash your hair. Now, wash the hair with a mild shampoo. Use only cold water as hot water is harmful to the hair roots. warm water and no shampoo. how soft, shiny and manageable your hair will be. ahhhh, I never tried SPA at home. A good shower, with gentle body scrubbing followed by oil massage and again a shower with your favorite body wash. Finally using a good body lotion.. I do not have FB believe or not but its a great contest and the packaging its pretty. hey thanks 4 ur lovely giveaway . i am doing at home so i do it with homely atmosphere i mean no botheration of candles or music or fragrance ect. my hair spa funda is simple and yes it is giving result too so i try to do it atleast once in a month . now wash ur hair with ur favorite shampoo which suits u .and wash with lukewarm water and apply conditioner after that too and rinse properly . now a days i’v got hair-fall and dandruff so in last step i apply hair mask too . apply thoroughly on ur hair and wrap it with hot towel for 10-15 minutes .and rinse properly with warm water . and ta daaaaaaa ur hair spa is done . I love getting a SPA but not always I get time to go and then to relax my body and mind, I go for DIY SPA at home! Firstly, I gather my needed things for the treatment- cleanser, body scrub, chocolate pack, shower cream, jasmine body oil and lastly, body butter. To set the atmosphere, I play soothing mind relaxing music on my tab. Then I start off with cleansing my body with a mild cleanser and with a loofah I rub of any dirt. After washing with lukewarm water, I start to scrub. I give my 20 minutes in scrubbing because, it is very essential for getting rid off the dead cells and making my soft and smooth. Then again I wash it off and apply the chocolate pack all over my body. The aroma of chocolate bring life to my senses. I close my eyes and relax for at least 30 minutes if not fallen asleep! With lukewarm water I wash off the pack and apply the jasmine body oil. Again Jasmine is my favorite scent of all and then I start massaging my body from legs to hands and shoulder and everywhere else I could reach for! Finally I take shower with a SPA shower cream and dry off with a hot towel to relax my muscles. Then I apply my favorite body butter to nourish and hydrate my skin and voila, I feel pampered! As I need a real time relaxing during my body spa, I do hair spa separately. I apply deep conditioning hair oil and massage it very lightly for 20-25 minutes until it is absorbed totally into my scalp. Then, I enjoy a turban therapy (i.e. making a turban of hot towel on my hair) for 30 minutes. Then, I wash off my hair with natural mild shampoo and apply an concentrated hair serum to protect and nourish my hair. This is how I do SPA at home! #For oiling, i personally use a mixture of olive oil, almond oil , coconut oil, and ghee. Warm these oils. When I heated the mixture and made it warm enough to touch without burning. I took it with my fingers and distributed evenly into my hair strands concentrating on the scalp and massaging it well with the help of my mother and leave it for around 1.5 hrs..
#Next washing my hair with a mild shampoo and let the hair dry naturally without blower etc..
#For Conditioning,i use the tea decoction as well as little mehndi and mix it well.Allow some time for rest to the mixture.Then apply it on my hair as the mixture will intensify the colour of my hair and at the same time will condition it. Then after half an hour rinse it only with luke warm water (no shampoo). 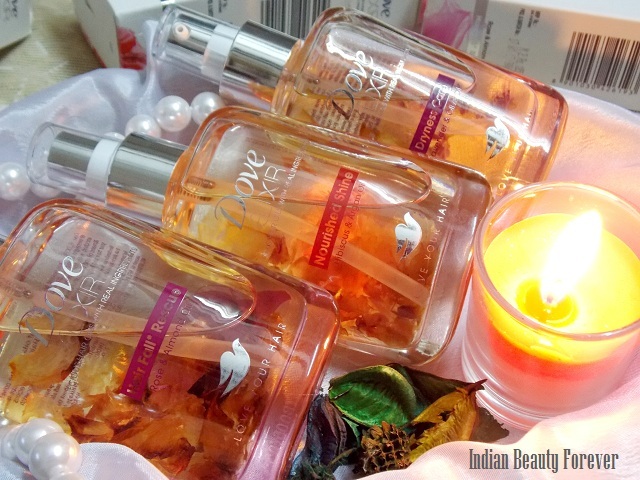 Hope u like it and may i won this beautiful hamper of Dove Elixir and next time enjoy my hair spa with it..
Usually Aromatic candles and nice subtle lighting brings spa mood at home. 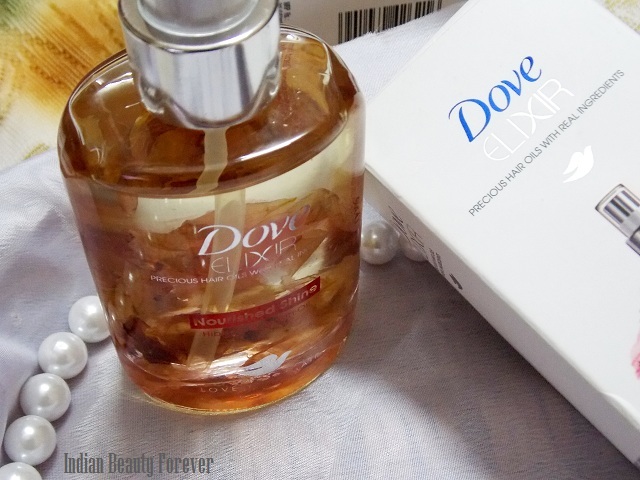 I apply Dove Elixir oil to my hair and I nicely massage my head, such that the oil reaches the roots of my hair. The next day morning, I apply the white yolk of egg to my hair. I leave it for about half-an-hour. After that, I take a refreshing head bath using Dove shampoo. This is how I do a hair-spa at home! 10 FINALLY jst slip into your favourite clothes put on some kohl add a dash of liptick and mascara AND your ready for a brunch or dinner date with your BFFS! The first step is to oil and massage hair and scalp with almond oil and rosemary oil. It nourishes hair, controls hairfall and adds shine and bounce to the hair. Next step is to lightly steam your hair using a hot towel. Wrap the hair in the hot towel for 10-15 minutes. Next, I apply curd as a hair pack. I leave it on for 15 minutes and rinse it out with water before I shampoo. Finally, I shampoo and condition my hair and towel dry it. I let it air dry and the end result is healthy looking shiny hair. Heat 1 half small cup almond oil wait for stitly cool. When the oul is still minimum warm then apply on the head and hair. Overall massage with oil on the scalp with hand or a finger tips like a circulr motion. And not stretch or pulling your hair during massaging because this activitie can be hair loss. THEN soak the towel in a small bucket or a tub with warm water. And wrap a towel to the head. Leave the towel around 10 to 15 min. This activitie causes for shaft the oil in the hair. wash the hair with shampoo mixed and rub gently. Then use conditioner on the tip of the hair. Please not rub your hair with for drying. Because they make rough, frizzy and splittings . The last step comb your hair with wide comb. Use dry for drying the hair. Without spa my hair look so frezzy,wavy and rough. My wonderful day when I do My Home Spa .. Being with a toddler baby, N looking after my whole family, is a hectic job.. So whenever I get time (or atleast once in a month) I make a day (usually only just some time :P) for my self to spend with myself n pamper myslef.. I start the my pampering with , First I Take fresh cream n put 1 string of kesar in it.. N now grind it with almond n keep aside.. Now I take warm coconut oil n apply it all over my hairs n scalp.. Now when the hair is done.. I take that cream n kesar mixture n apply it all over my neck n face… N let it dry for sometime… This gives my skin natural glow n moisture, Which is best for winter.. If I have more time Them I apply the above mixture to my body n let it fry too..
For my Lips I use Pure Ghee to give them moisture.. I do what My Granny always used to say to me to use lemon skin (left over skin after removal of jiuce) on my funny bone n around the neck, where it has become dark , so it would gradually make it normal to my skin tone..
Then I concentrate on my Hands n legs, which need to be looked at, after all those runnning around my daughter.. I take half bucket of luke warm water n add salt to it N keep my legs in them for 10 mins n them I use foot file to gently smooth rough skin..
As I have a small baby I usally don’t keep long nails .. So after I have remove d all the nailpolish from hands n legs, I exfoliate my hands with a mix of 2 tsp olive oil n salt n sugar.. Then I cut my nails n keep them clean..
Then In bath tub I add rosewater n coconut milk in it for some time.N some rose petals also in the bath would be awesome.. By lisenting to my favorite songs, by closing my eyes n just relax..
After all this I take head bath n just relax for some time.. N ready for the next home chores with fully pampered , rejuvinated n relaxed.. Done all the steps.. liked n shared..
Heat half a cup of extra virgin olive oil and let it cool. When the oil is still slightly warm, apply on scalp and hair. Overall oil massage of the scalp with fingertips with gentle circular motions. Make sure that you are not pulling your hair while massaging, as it can cause hair loss. Luke warm your regular hair oil and gently massage the scalp for 15 minutes. Cover your hair strands apart from the scalp, as oil provides moisture, especially at the endsof the hair strands that are most damaged and weak. You can use hair oils like olive oil, almond oil, coconut oil or jojoba oil, as these natural oils strengthen your hair. Use of hair oil makesyour hair healthy besides improvingthe blood circulation too. In this busy life, we keep thinking of taking time out for ourselves but not always possible to indulge in a long spa session. So I use very good personal care products just to turn that daily bath experience into something relaxing and spa like. For hair spa, I like to use a mixture of some essential oils like rosemary and ylang ylang in a base of some carrier oils. I mix a little quantity of many carrier oils. Rosemary and ylang ylang feel so calming and soothing they make me feel very light in the head. I do some gentle massaging to make the oils go down down into the scalp. Then spend some time in the evening reading a favorite book in complete silence. Then I light some candles around and switch off the lights and enjoy the reflections made by the candle light on the walls around. It so helps to relax and calm my mind, in fact I used to do it a lot when i used to make my own candles. And then have a good relaxing sleep overnight and shampoo my hair next day. Already following you on Facebook and twitter. I don't have the time of doing home spa most of the times so I rely on products like handmade soaps etc. My Idea for having a spa at home is.. Step 1- Put on soft music and aroma candles at one part of the room and sit in a relaxing position. Step 2- Massage ur scalp.Message head with coconut oil for 15-20 minutes with the tips of ur finger as it increases blood circulation and helps in increasing hair growth. Step 3-Stream warm hair.Dip a towel or cotton cloth in warm water and squeeze it to remove excess water.Wrap this towel around ur head covering the oiled hair for around 10mins. Step 4-Wash ur hair ad apply conditioner on it. Hair spa at home means.. getting those luscious and silky soft hair with minimum effort.. I usually indulge myself in homemade hair pack..
2. Aloe vera massage.. blended with almond oil..
Apples are notorious for their nutritional benefits; they’re 85% water and high in potassium and vitamins A and C. Perhaps even more beneficial is the malic acid, an exfoliating enzyme in apples that is useful for removing dead skin cells and surface dirt. Mix all ingredients, stirring well. In the bath or shower, apply scrub to skin in a circular motion, using a washcloth, bath gloves, or a loofah sponge. Pay special attention to rough spots like elbows, heels, and knees. Rinse well, and follow with a rich body lotion. Note: If using on the face, omit granulated sugar. Brown sugar, because it dissolves gently, is a more appropriate choice for the delicate skin of the face. 1. Massage your scalp: This is the first step to start a hair treatment at home. Warn some coconut oil or olive oil. Massage your head with this. This increases blood circulation and boosts hair growth. 2. Steam the hair: Dip a towel in warm water and squeeze the excess water out. Wrap the towel around the hair. This allows the oil to penetrate deep into the scalp. Do this for about 5-six minutes. 3. Wash your hair: Now, wash the hair with a mild shampoo. Use only cold water as hot water is harmful to the hair roots. 4. Apply conditioner: Post the shampooing, use a conditioner. You can also use the water of tea leaves to which a few drops of lime juice has been added. Or try a paste of grated beetroot to which hibiscus powder has been added. The hibiscus flower powder is a great base and is rich in iron and other vitamins. Rinse it off after half an hour with just warm water and no shampoo. 5. Lastly, a hair mask In a bowl, mix two eggs, honey and some coconut oil. You can add a ripe banana to this — banana is a softener. You can also use olive oil instead of coconut oil. Leave the mask on for 20 minutes, then rinse with a mild shampoo. Hair spa is usually made up of massage oil, hair mask application, shampooing and deep conditioning. First heat half a cup of extra virgin olive oil or any other hair oil and let it cool. When the oil is still slightly warm, apply on scalp and hair. Overall oil massage of the scalp with fingertips with gentle circular motions. Next, soak a clean towel into a bucket of warm water. Squeeze the towel to remove water. Wrap a warm towel to the head, so the hair is covered by a towel. Leave the towel wrapped around his head for 10 to 15 minutes. This will help the oil get into the hair shaft. The next step is to wash the hair with shampoo thoroughly. Choose a shampoo that suits your hair type and texture. Rinse hair with warm water. Hair conditioner rinse to remove. Pat with a towel to dry and remove the water on the hair. Next, comb the hair using a wide-toothed comb. Apply a hair mask - (mix up a single teaspoon of honey into one glass of whole milk) massage it into your hair from root to tip. Leave it on for 15 minutes and rinse with lukewarm water and shampoo. It works magic. You will fall in love with your hair. and use scented candles to trigger reactions within the body which relieve stress, enhance mental clarity and concentration, helps to gain energy, create sensual mood and setting. Wash your hair: Now, wash the hair with a mild shampoo. Use only cold water as hot water is harmful to the hair roots. NOW TIME FOR BATH SHE PUT SOME ROSE PETALS ON THE WATER .ADD A FEW DROPS AT A TIME OF YOUR FAVOURITE ESSENTIAL OIL SCENTS AND SLIP INTO BATH TUB TO RELAX IN HOT WATER BATH.CLOSE YOUR EYES ENJOY THE FRAGRANCE,MUSIC,CALMNESS.AFTER TAKING LUKE WATER BATH WITH DOVE SHAMPOO..I FEEL SO GUD . Rinse hair with a mixture of two tablespoons vinegar to one cup water, or one-quarter cup of lemon juice and one cup of water. Use an alcoholic drink to create a drying effect on the hair. Mix a few tablespoons of alcohol with a cup of water, use to cleanse hair, and then rinse with water. One-quarter cup of cider vinegar mixed with water can be used to create a spray that targets product build up. Use diluted tea, which contains an astringent, to rinse your hair. So here is my spa at home ..
1- Dim light and play a soft slow music. 2- Then I massage my hair with oil which is a mixture of olive oil,almond oil and coconut oil. 3- Then I wrap a hot towel for 20 minutes. 4- Then wait for 2-3 hours to penetrate oil through the hair roots properly,then wash with my favourite shampoo and conditioner . 5- After that i apply my best fenugreek seed and curd homemade hair mask,again wait for 1hour. then wash again . 6- In between i also massage my body. So here is my spa at home process which i prefer to do on holidays..
1-Dim the light and plays slow old musics. 2- Start massaging oil on hair which is a mixture of olive oil,almond oil and coconut oil. 3- Then after massaging wrap a hot towel for 20 minutes. 4- Then wait for 2 hours to penetrate oil into the hair roots properly. In between i also pamper my body by massaging ..
5- then wash my hair with my favourite shampoo and conditioner. 6- Then i apply my best ever fenugreek seed hair mask which i prepare at home before and wait for 1hour. In the mean time i apply my gram flour face pack on face to pamper myself more. 7- thenafter 1 hour wash my hair again and the final out come is very beautiful shiny hair with glowing face. Apply yogurt mixed with an egg two hours on your hair before taking shower for shiny and healthy hair. oil and massage hair with almond oil. Almond oil has vitamin E and D which is said to nourish hair, make it long and thick, control hair fall and add shine and bounce to your hair. Massage the oil well into your scalp. I Leave on overnight or for about 1-2 hours. Clean your skin with a mixture of milk powder, rose water and lemon juice. Scrub with this mixture for 20-25 minutes. 2. Wash your body with cold water and completely remove the mixture from body. 3. Take six capsules of vitamin E. These capsules are available in market and which are cheap too. Massage with the Vitamin E oil for 10 minutes so that the oil get absorbed by the skin deep within. Instead of vitamin E oil you can go with sesame oil and olive oil. Take 20 ml of each oil in a bowl and mix well. Add saffron and heat the oil in microwave or on gas for 3 minutes. Cover the mixture and rest it for 10 minutes. Then apply the mixture on body. 4. Wrap your body with mask made of one cup of fuller’s mud (Hindi: multani mitti), few camphor (Hindi: Karpur) and half a teaspoon of sandalwood (Hindi: Chandan) paste made from sandalwood stick and milk. Apply this mixture on body and leave it for 20 minutes. 5. After that wash it off with warm water and then moisturize with any suitable moisturizing cream. Body spa has physical and mental benefits both together. It creates wonder for those who are stressed out and also it enhances your beauty naturally. Have a good soak in the tub with homemade aromatherapy treatments. The base of all aromatherapy bath salts is one part sea salt, two parts baking soda, and one part Epsom salts. Mix it all up, and add a few drops at a time of your favorite essential oil scents. 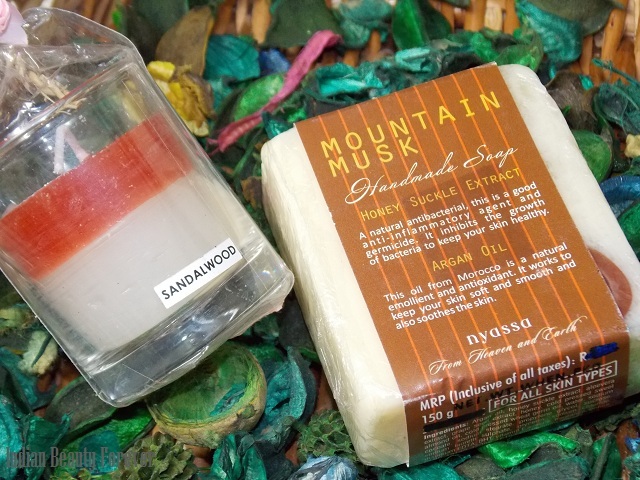 Scents like vanilla and chamomile are popular for relaxing in the tub. Sit and soak in the tub for as long as you need to and get the aromatherapy spa experience at home. Steam facials are very easy to give yourself at home. Boil water and let it sit for a bit before steeping herbs in the water. Good herbs for a steam facial include peppermint, green tea, and lavender. You need the water to be hot enough to provide five minutes of steam. Once the herbs have steeped for a few minutes, put your face and the water underneath a towel. This keeps the steam in, opening your pores up for deep cleaning. Always wash your face and remove all makeup before giving yourself any kind of facial treatment. My spa therapy at home includes pampering of my skin and hair. At first I decorate my room with aromated candles and rose petals. Then I indulge in pampering of my skin. I exfoliate my skin gently with natural papaya enzymes, to give it a natural glow. 1. I wash face thoroughly. 2. Then I bring a vessel of water to boil. 3. While water is heating, I mash 1/2 of a papaya into a paste. 4. Then I move vessel to table and place face over steam, holding a bath towel over my head. Adjust to be sure skin is at a comfortable temperature. 5. Steam face for 5-8 minutes. 6. Apply papaya mixture, carefully avoiding the eye area. 7. Lie down and relax for 5-10 minutes. 8. When I feel fully rejuvenated, I rinse my face and apply moisturizer for a radiant complexion. Next, I pamper my hair. 1. First I heat half a cup of extra virgin olive oil and let it cool. When the oil is still slightly warm, apply on scalp and hair. Overall oil massage of the scalp with fingertips with gentle circular motions. I make sure that I am not pulling my hair while massaging, as it can cause hair loss. 2. Next, I soak a clean towel into a bucket of warm water. Squeeze the towel to remove water. Wrap a warm towel to the head, so the hair is covered by a towel. Leave the towel wrapped around my head for 10 to 15 minutes. This will help the oil get into the hair shaft. 3. After applying steam to the hair, the next step is to wash the hair with shampoo thoroughly. I choose a shampoo that suits my hair type and texture. Rinse hair with warm water. 4. Wipe off excess water in the hair. Make sure that I do not rub my hair with a towel as it can make the hair rough up the cuticle and contribute to frizziness. 5. Then I take a few deep conditioner and apply it on my hair, use a wide toothed comb. I use a natural conditioner that suits my hair type. With deep conditioning, I can protect my hair from frizziness. Leave the conditioner on my hair for 15 to 20 minutes. 6. Then I rinse my hair to remove hair conditioner. I pat with a towel to dry and remove the water on the hair. Next, I comb the hair using a wide-toothed comb. Apply a hair mask to each section of hair. Make sure that every hair is coated with a hair mask.Then I wrap my head with a warm towel for 10 to 15 minutes and then wash it off thoroughly with warm water. In this way, I pamper my skin and hair at home. I am very much comfortable about doing spa at home with natural productS other than going to beauty parlour & expensive chemical spa. The four steps of hair spa are oiling,shampooing ,conditioning & applying hair mask. Massage the scalp nicely with warm olive oil to relax for about 15-20 minutes. Once done with oiling, just wrap a towel dipped in warm water around your head. The idea is to provide steam to your hair. The steam provided to hair helps in penetrating the oil within the scalp. The next step in this hair spa procedure is shampooing. It is better if the first step is done at night and the oil is left as it is overnight. Though in case you don't want to keep the oiled hair overnight just shampoo them well with a mild natural shampoo after 2-3 hours. Next condition the hair with a suitable conditioner. It would be better to use a herbal hair conditioner than a chemical laden one. Egg and Oil Hair Mask- We need a well beaten mixture of 2 eggs and 6 spoonfuls of coconut oil. Whisk it thoroughly to get a smooth mixture. Apply this mixture on scalp with the help of fingers. The heat produced by the friction of fingers while massaging would help the oil penetrate deep into the scalp thus, nourishing the hair. Cover the hair after applying it evenly all over the head rinse it off with a herbal shampoo after 20 minutes.